Ms. Shaikh was born in Southern California. During her childhood, she called a number of places throughout the United States and the world home, but returned to California for high school and college. Ms. Shaikh graduated from UCLA with a bachelor’s degree in Biochemistry and then continued to UCSD where she earned a PhD in Biology with an emphasis in Immunology. 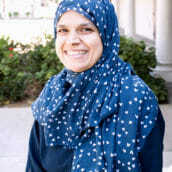 Ms. Shaikh then served as an Adjunct professor at Cypress College teaching Biology for two years. When Ms. Shaikh’s second child was born, she dedicated herself, full-time, to nurturing her growing family. In 2015, Ms. Shaikh embarked on a homeschooling journey with her older son. This experience has opened her eyes to the true capacity for learning that children have when allowed to explore their passions. She looks forward to sharing her passion for science at the Arbor Learning Community!